I have always been meaning to figure out a simple way to characterize the strength of some of the wood that I use. Looking around on the web, there is the well established Janka hardness test. 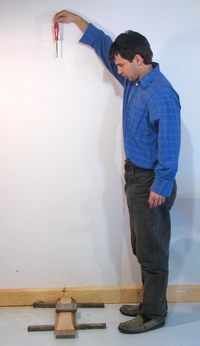 This test involves pushing a steel sphere of 11.28 millimeters half way into a piece of wood. Doing this requires a specialized machine that can apply several tons of force while measuring that force precisely. I certainly wouldn't be able to build a machine to replicate this test, and certainly not out of wood. But it inspired me to devise my own sort of hardness testing, which requires no equipment at all. The test involves dropping #2 Robertson screwdriver (red handle) from 1.5 meters (5 feet) onto a piece of wood, and measuring the depth of the resulting divot this makes in the wood. Because the size of the tip of a Robertson screwdriver is standardized, to reproduce the test results, all you need is a Robertson screwdriver of the same style, or at least one of the same weight. I weighed mine at 92 grams (3.25 ounces). 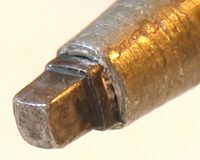 The tip of a #2 Robertson is nominally supposed to be .125" (3.17 mm), though they typically are a little bit less than that to go into the screws more easily. Mine measured .118" x .118"
I ended up putting a small hook in the back of my screwdriver to allow me to drop it more precisely. I also put a mark on the wall for where to hold the screwdriver, and a mark on the baseboard for where it lands if dropped carefully. 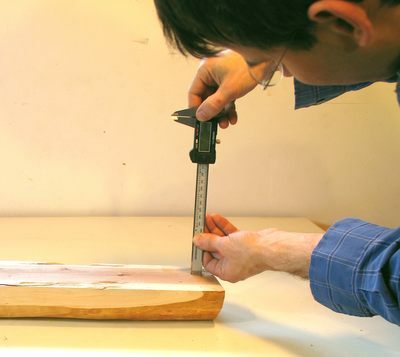 It's important to make sure the sample being tested is on a firm base, especially for small pieces of wood. I rested the wood on some pieces of solid steel, and then weighed the piece of wood down with another piece of steel to make sure that it was making full contact with the piece under it. 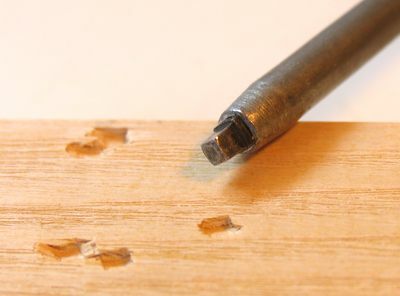 Otherwise, for a light piece not well supported, the screwdriver's momentum might get absorbed by moving the piece of wood instead of damaging the surface. It's more important for the base to be heavy than firm. As long as the piece of wood and the base it's resting on weigh 20 times as much as the screwdriver, it should be ok.
For furniture and floors, the main advantage of hardwoods is that they dent less easily. 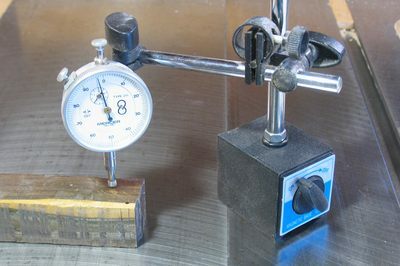 Characterizing the size of divot from a standardized size impact is a more realistic measure of how the wood will stand up to daily abuse than it is to force a much larger steel sphere half way into the wood as is done with the Janka hardness test. So how well the wood stands up in these tests should be at least as good a measure for durability than Janka hardness test scores. Most of the divots I made were deep enough that I could get a good measure of them with a digital caliper. I usually did four drop tests, just to average out variations that might occur from hitting different parts of the wood's grain. My test does give a small advantage to more resilient materials compared to the Janka hardness tests, because I measure the depth of the divot after the impact. Rubber would do well in my test because it bounces back after impact. But for furniture, and for flooring, material that indents and bounces back also has an advantage, so the fact that my test rates resilient materials higher only makes it a better indicator of how well a material will stand up to daily abuse. For some African hardwoods, and non-wood materials, I had to resort to using a dial indicator, and slowly moving the wood back and forth to figure out the depth of indentation. For example, for this piece of Lignum vitae at left, the divots were only .002" to .004" in depth. Less deep than the divots I got when I tested my method on brass (.005") and aluminium (.005"). Lignum vitae is incredible stuff. It's no wonder that wooden bearings from this wood would outlast ones made of brass or steel for some applications. This table represents the test results, sorted from softest material (deepest divot) to hardest. I also tested a few other materials, just for reference. For many woods, I tested more than one piece. The depth of divot on individual pieces usually was quite consistent, but from piece to piece, I got quite a bit of variation. Species of wood that I tested more than once are listed multiple times at left. One of the interesting results I got was just how much variability a certain species can have in terms of hardness. The greatest variability I got was from spruce, all of which I had bought The Home Depot. On selecting lumber, I could always tell that some pieces of lumber felt much heavier than others, and tended to select for the heaviest pieces I could find. Of course, I can't be entirely sure that every piece of spruce at The Home Depot really is spruce. But it's certainly softwood. My softest piece of spruce divoted .143", while the hardest divoted only .058". What's interesting is that my heaviest pieces of spruce beat out several hardwoods for hardness, including some samples of walnut and red oak. 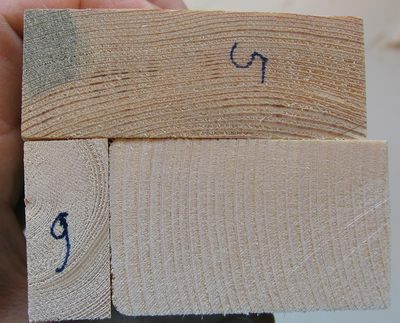 The hardest piece of spruce is the blue stained piece at the top, labeled '5'. My softest and lightest is the one below right. I had already started using heavy pieces of spruce in some jigs where hardness was called for, but I didn't want to splurge on hardwoods. Now I feel justified in doing this. Some pieces of spruce don't just feel hard and heavy - they really are as hard and heavy as hardwoods. But it wasn't just spruce that showed a lot of variability. In general, any species that I tested more than one sample of showed quite a bit of variation. For example, the "Red oak" and the "Oak flooring" pieces were both red oak, but varied a lot in hardness. What also surprised me is how well plain old MDF and particle board performed in the test. 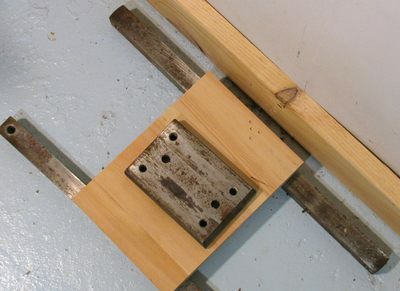 I personally rather dislike particle board and MDF for making jigs and such, but the MDF did better than any non-exotic or rare species of wood that I tested. With the hardness variations I saw within the same species of wood, I would suggest that its probably not a good idea to rely too heavily on published hardness tables for different types of wood. In general, the heavier the piece of wood, the harder it was. So when you need to select lumber for hardness, it may be wise to just test it on the spot by dropping a screwdriver on it. It's a quick and easy test, and it only does relatively minor damage to the sample. There is also a German version of this page.